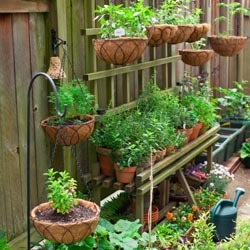 Practiced by organic gardeners for years, companion planting has become very popular for all gardeners. The concept is to plant together species that will benefit each other, to help prevent disease and insect infestation without the use of chemicals. In general, herbs and other aromatic plants like tomatoes, marigolds and onions are helpful in warding off insects. Certain colors, like the orange of nasturtium flowers, are thought to repel flying insects. While these practices have not been scientifically proven, many gardeners have been using them for years with positive results. Try it – and see if it works for you! Basil – Enhances the growth of tomatoes and peppers. Dislikes rue. Repels flies and mosquitoes. Borage – Companion to tomatoes, squash and strawberries. Deters tomato worm. Chamomile – Companion to cabbages and onions. Improves the growth of all garden plants. Chervil – Companion to radishes. Chives – Companion to carrots. Deters Japanese beetles, blackspot on roses, scab on apples and mildew on cucurbits. Dill – Improves the growth of lettuce, cabbage and onions. Dislikes carrots. Fennel – Most plants dislike it – avoid using it as a companion herb and instead plant it away from the garden. Garlic – Plant near roses and raspberries. Deters Japanese beetles. Horseradish – Plant at the corners of your potato patch; deters potato bug. Hyssop – Companion to cabbage and grapes. Deters flea beetles and cabbage moths. Dislikes radishes. Marigolds – Plant throughout the garden as they discourage nematodes and other insects. Mints (esp. Spearmint and Peppermint) – Companion to cabbages and tomatoes. Deters aphids, flea beetles and many types of cabbage pests. Nasturtium – Companion to radishes, cabbage and cucurbits. Plant under fruit trees. Deters aphids and squash bugs. Onion – Repels cabbage loopers, potato beetles, carrot flies and imported cabbage moths. Oregano – Improves the growth of beans. Parsley – Enhances the growth of roses. Repels asparagus beetles. Pot Marigold – Companion to tomatoes, but plant elsewhere, too. Deters tomato worm, asparagus beetles and other pests. 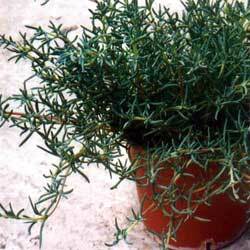 Rosemary – Companion to cabbage, bean, carrots and sage. Deters cabbage moth, bean beetles and carrot fly. Rue – Companion to roses and raspberries, dislikes sweet basil. Deters Japanese beetles. Sage – Plant with rosemary, tomatoes, strawberries, cabbage and carrots. Dislikes cucumbers. Deters cabbage moth and carrot fly. Summer Savory – Companion to beans and onions. Deters bean beetles. Tansy – Plant under fruit trees. Companion to roses and raspberries. Deters flying insects, Japanese beetles, striped cucumber beetles, squash bugs and ants. 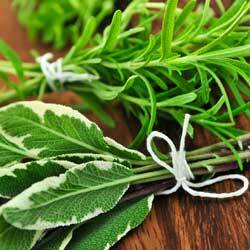 Tarragon (French) – Enhances the growth of all vegetables. Thyme – Improves the growth of tomatoes, potatoes and eggplant. Repels whiteflies and cabbageworms. Wormwood – Use as a border, keeps animals from the garden. Yarrow – Plant along borders, paths and near aromatic herbs. Enhances production of essential oils. Attracts beneficial insects including ladybugs and predatory wasps. Exactly how much benefit companion plants give to one another will vary; be sure to choose varieties to group that have similar soil, light, water and fertilization needs. Even if their companion benefits may not pan out, you’re sure to enjoy a more diverse and vibrant garden filled with delicious vegetables and herbs!